Excerpt from Federal Reserve Bank of Dallas: One way to measure the cost of lost output is in terms of how much worse off society is relative to a baseline trend that might have existed absent the crisis. Such an exercise is crucial to grasping the magnitude of what occurred and the effects of the still-emerging recovery. 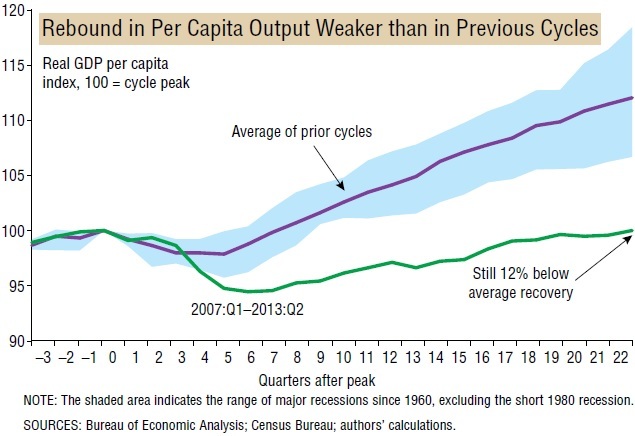 Output per person as of mid-2013 stood 12 percent below the average of U.S. economic recoveries over the past half-century, corroborating a large body of literature suggesting that recoveries from financial crises are slower than rebounds from typical recessions (Chart 1). Our bottom-line estimate of the cost of the crisis, assuming output eventually returns to its precrisis trend path, is an output loss of $6 trillion to $14 trillion. This amounts to $50,000 to $120,000 for every U.S. household, or the equivalent of 40 to 90 percent of one year’s economic output. This seemingly wide range of estimates is due in part to the uncertainty of how long it might take to return to the precrisis growth trend. However, output may never return to trend—the path of future output may be permanently lower than before. If that’s the case, the crisis cost will exceed the $14 trillion high-end estimate of output loss. 1. The populations of competitive economies are now better educated relative to us. 2. Technological capability, plant, knowledge, and machinery of our competitors is more advanced relative to our levels than at any prior time in the post WWII era. 3. Our population average age is increasing. 4. Our constant-dollar per-capita incomes, despite some recent mild decline, is the highest of all large industrial nations, and in some cases higher by a large margin. 5. Trans-oceanic transportation costs have declined relative to product value, thus making our markets more vulnerable to overseas producers. 6. Our education system appears to have fallen behind our education needs, and most so in the STEM fields. 7. Out influx of illegal immigration has brought us substantial numbers of poorly educated, poorly accepted, and typically weak in English language skills. As these immigrants become part of our social fabric, they impact our per-capita average economic performance. 8. Our ability to effectively manage our economy is impaired. We have an unsustainable high level of national debt increase that threatens our long term security. We need not identify ourselves with Greece in order to realize that debt can be dangerous if not limited in size and rate of growth.